Just because a movie has been delayed for quite sometime doesn't mean it's not worth the effort. Seventh Son has had a hard time making its way to the big screen after Legendary moved from Warner Bros. to Universal. But the studio is finally ready to unleash this fantasy adventure starring Julianne Moore and Jeff Bridges. And they've debuted three clips and a creatures featurette to get you excited for this fun and thrilling fight against the forces of evil! 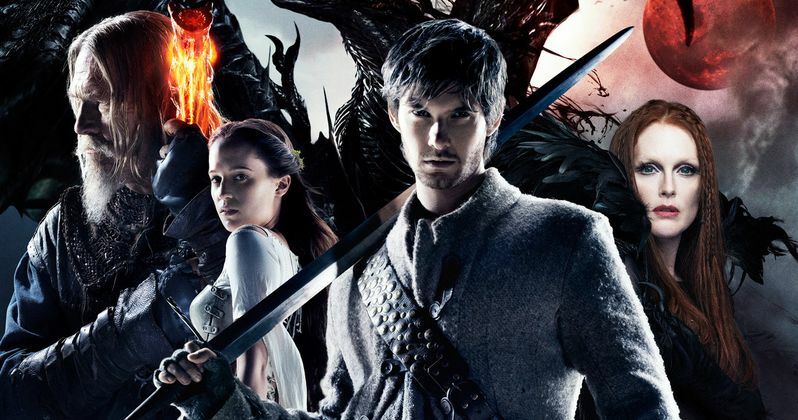 Directed by Sergey Bodrov (Mongol), the story follows the seventh son of a seventh son (Ben Barnes) who teams up with 'The Spook' (Jeff Bridges) to fight off supernatural monsters and protect the locals. They soon find themselves facing off against a very powerful witch named Mother Malkin (Julianne Moore), who has escaped from Spook's prison and is ready to unleash Hell on earth. The new Seventh Son featurette offers a peek at some of these evil entities at Malkin's disposal, including Djimon Hounsou as Radu, a shapeshifting warlock who is always ready for battle. We also get to see more of Mother Malkin at her worst in these latest clips, which help set up Alicia Vikander as Alice, a good witch who enjoys the occasional moonlight swim. Check it out, and then be sure to check out Seventh Son in theaters this February.